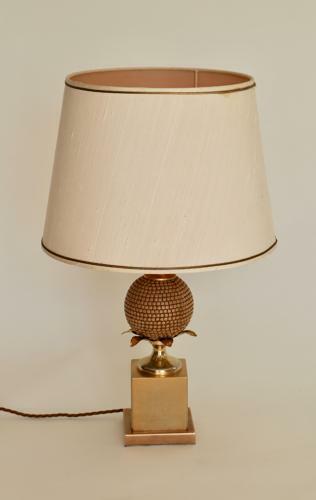 French table lamp from the 1960's. Brass, gilt metal and moulded resin. Near pair to the other one listed. This has a slightly darker tone to the moulded form in the middle. The heights without the shades and other mesasurements are identical. Original cotton shade with a light pink / apricot interior (hence the light in the photos) which measures 32 cm wide at the bottom and 25 cm wide at the top. Height to the lamp holder is 30 cm high. Base measures 10 cm by 10 cm.